FREE SHIPPING - Unique Steering Wheel Column Mount, Free Up Space! INCLUDES Cooler and all Hardware! Need to outfit a Fleet? Call us for bulk pricing on 3 or more units! -No more need to exit the golf car to access your cooler. -It's only an arm's reach away. Cooler Tray/Valet Tray frees up the limited space on the rear of most golf cars for other accessories while still providing a place to keep those beverages cold. -The cooler is strong, lightweight, and durable. -Fits virtually all makes and models of golf carts. 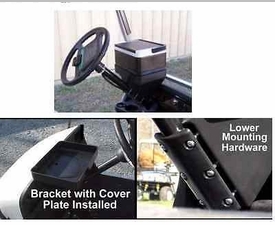 -Mounts easily and securely to the steering column with our simple mounting bracket and hardware. -Does not impede entry or exit, interfere with vehicle operation, or impair vision. -Front edge of cooler does not touch windshield. -Designed to provide a secure fit, yet the cooler can be removed easily at any time. -Made of high impact polyethylene plastic. -Many customers choose to use the tray for storage; i.e., cell phones, car keys, cigars, etc.